Working around the clock, flight controllers, astronauts and engineers are fine tuning a daring plan to put an astronaut on the end of a long boom attached to the space station's robot arm - farther from the safety of the lab's airlock than any spacewalker before him - to perform emergency surgery on a mangled solar array. Using insulated tools to minimize the risk of shock from the damaged-but-electrically-active solar panel, Scott Parazynski, a former emergency room physician and one of NASA's most experienced spacewalkers, plans to cut snagged guidewires if necessary to release tension before installing cufflink-like clips to strengthen the torn blanket enough to permit its full extension. The P6-4B solar array is mounted on the far left end of the space station's main power truss, half a football field from the space station's pressurized modules. 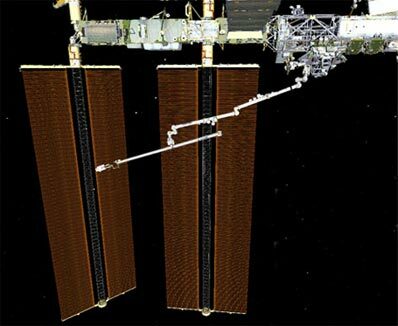 To reach the site of the damage, Parazynski, perched on the end of the shuttle's heat-shield inspection boom and carried by the space station's robot arm, will be positioned eight to nine stories from the end of the lab's main power truss. To put that in perspective, picture the space station's pressurized module running across a football field at the 50-yard line. Looking down from the press box, Parazynski will be anchored to a boom high above the left end zone goal posts. "We're faced with a difficult situation," said astronaut Dave Wolf, a Mir veteran who oversees NASA's spacewalk office at the Johnson Space Center in Houston. "It's a real test of the adaptability of this team, the baseline knowledge, how to work in space. We're pulling that all together, we have a time limit, of course, on this mission, we're working around the clock. And I think we're onto a solution that should work, get us pretty close to a permanently acceptable situation. We'll see how it goes Saturday." Said lead spacewalk planner Dina Contella: "We have just a huge number of people that are right now trying to help the EVA (spacewalk) team how to go and both clear what snagged on the array and help understand how to fix the structural loading issue we might have with the array. It's been an incredible effort to pull it all together." The Discovery astronauts successfully moved the 17-ton P6 solar array truss segment Tuesday, bolting it to the far left end of the space station's main power truss. The first of its two solar array wings, known as P6-2B, extended a full 110 feet as required, but the crew aborted deployment of the second P6-4B wing when one section of hinged blanket slats hung up, possibly due to a guide wire snag. Two seams between adjacent slats pulled open, resulting in separate tears, and the edges of several nearby slats were crumpled. The largest rip measured some two-and-a-half feet long. Eighty percent deployed, the P6-4B array can generate 97 percent of the electricity of a fully extended wing. The station is not yet using power from the torn array, but engineers say tests confirm no major damage to its internal wiring. The immediate concern is figuring out a way to fully extend the P6-4B wing to provide the necessary structural rigidity. With a partially deployed panel, none of the arrays on the left side of the main power truss can be rotated as required to track the sun without risking additional damage. As a result, the station's left-side solar alpha rotary joint, or SARJ, is locked in place until the damage is fixed. Adding to NASA's problems, the station's right-side arrays also are locked in place because of unexpected metallic contamination inside the starboard SARJ. Parazynski and Doug Wheelock were in the process of gearing up Wednesday for a spacewalk to inspect the starboard SARJ Thursday when NASA managers decided to focus instead on fixing the P6-4B solar blanket. Engineers initially held out hope for a repair spacewalk Friday, but NASA managers decided early Thursday to wait until Saturday, giving engineers more time to fine-tune the plan. "We made a decision last night that we weren't going to get there, that we weren't going to be ready for a Friday spacewalk," station flight director Derek Hassmann said today. "We knew it would be a full court press to get there on Friday. I'm disappointed we didn't get there, but I'm satisfied we made a good call." On Friday, the station's robot arm will be moved 80 feet, from work site 8 on the left end of the main power truss back to work site 3 near the center of the lab complex. Once in place, it will reach into the shuttle's cargo bay and pull out a 50-foot-long heat shield inspection boom, grappling an attachment fitting in the center. Pulling the orbiter boom sensor system, or OBSS, clear of Discovery, the station arm will hand it off to the shuttle's own robot arm to provide keep-alive power for heaters and other systems in the boom that support a laser scanner and camera mounted on one end. The instruments will be used after undocking from the station to look for signs of impact damage on the shuttle's nose cap and wing leading edge panels. With the shuttle arm holding the OBSS, the station arm will be moved back out to work site 8, the closest the Canadian-built crane can get to the P6-4B solar arrays. Early Saturday, the station arm will re-grapple the OBSS and position it just to the left of the central section of the power truss to await Parazynski and Wheelock. The spacewalk is scheduled to begin around 6:30 a.m. Saturday. After attaching a foot restraint and an extension fitting to one end of the OBSS, Parazynski will lock his boots in place and the arm will slowly maneuver him outboard to the P6-4B array. Wheelock, meanwhile, will make his way to the base of the outermost solar array to provide visual cues to arm operators Stephanie Wilson and Dan Tani. At that point, Parazynski will be farther from the safety of the station's airlock than any astronaut has ever been. NASA's spacesuits are equipped with an emergency oxygen supply good for 30 minutes in case of a major problem that might cut off an astronaut's air supply. Spacewalks typically are designed so an astronaut is never more than a half hour away from the airlock. But not in this case. Wheelock will be roughly the same physical distance from the airlock as Parazynski, but it would take Parazynski longer to get there in an emergency because of the slow movement of the robot arm. "There are some things in this spacewalk that are a little higher risk than usual," Wolf said. "One is being very close to a damaged electrical power generating system and perhaps with some free parts as we cut pieces away. We've taken measures with the (tools) and various insulating materials ... Another is when Scott is out in that remote position, it will take longer than usual should he have a suit failure to come back in. We try to make that 30 minutes normally. He won't be within 30 minutes. We're making it as short as we can. But there comes a time when station needs repair, one time events, where we, with good mitigation and knowledge, accept higher risks in some areas. And that's one of them." Once in position near the rips in the solar arrays, Parazynski will give engineers their first detailed description of the damage. "To be honest, we don't have a really great feel for the exact configuration for that snarl," Contella said. "We know there's a snag there, but we're not sure if it's something that's really easy, that you'd be able to clear, or if it's something that's going to be a little bit more complicated." One major concern is the guidewire that presumably caused the damage when it hung up during deploy. "If we have any kind of issue where we suspect that we'd have a problem with the guidewire then we'd have to cut the guidewire," Contella said. "And so, currently the idea is you have a pretty big snarl here, you cut at the bottom, you cut at the top and then take the offending part out. It sounds pretty easy, but pulling from the bottom is a guidewire tension mechanism that's pulling with about a pound of force, which is not very much force at all. But when we cut it, we're expecting it to maybe automatically retract down into the lower containment box of the array. "So it would just pull straight through the grommets and be wound at the bottom," she said. "At this point, we're trying to determine what is the best way to allow that to occur. It might be it doesn't retract at all. ... potentially you could�have it such that it comes down and it doesn't retract enough and you might need to assist it in some way or if it gets caught up, you might need to cut the whole thing off and wrap that up and put it in a trash bag." Fixing the rips in the blanket is another challenge, but engineers devised a clever solution. The idea is for Parazynski to insert homemade tabs that work like cufflinks through holes in the blanket slats that were used to secure the panels during launch. Fold-out latches, like the wings of a cufflink, would prevent a tab from pulling back out of a hole. The other end would be inserted through the corresponding alignment hole in an adjacent slat. The cufflinks should enable the blanket to carry the 70 pounds or so of tension it will experiences when the array is fully extended without pulling the ripped seams apart. It is that tension that provides the necessary structural stability and, in this context, the force that could pull the ripped slats apart if nothing was done to strengthen the area. Throughout the work, Parazynski will take care not to touch the electrically active solar array or allow any of his tools to come in contact with the structure. The tools will be triple wrapped in non-conducting tape. While the risk of a potentially deadly shock is not zero, Wolf said, training, preparation and common sense reduced the likelihood of injury to an acceptable level. "You can come up with scenarios that would do anything," Wolf said when asked if electrocution was possible. "We have upwards of over a hundred volts DC power on that array. ... It's not the kind of thing that would burn you, but we could get conduction through the heart, let's say, or mild shocks. This is not going to happen, we have very good techniques to insulate and control the array."